We welcome children of all ages to learn about God’s grace and have fun. Kids Discovery Zone is provided for children of all ages at the 10:00 a.m. education hour. We encourage all families to worship together during one of two services. GCC believes that parents are integral to establishing worship as a family heritage with their children. Sunday school or children’s church is a bonus. Kids Discovery Zone is an exciting, active format to share God’s truth with our children. The program is for children 4 – 12 years old. An alternative interactive program is provided for children 2 – 3 years old. For young parents who wish to keep their child with them, we have a room across from the pastor’s office for young parents and their children. There is a speaker and rocking chairs for your convenience in this area. 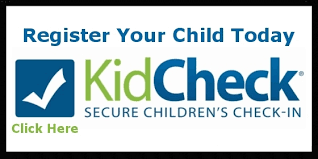 We use KidCheck to secure your children’s time in our care. Please register your information and we will be ready for you on Sunday! Children’s Church (4 years old through 3rd grade) is provided for families at both Sunday services. While we encourage parents to teach their children through worship, this alternative provides an age appropriate message for our children. Children are dismissed for children’s church before the start of the sermon. It is an option for parents with children through 3rd grade. Nursery for infants and toddlers is provided at all Sunday Services. Mrs. Janice Ring is our children’s ministry director. She has over 20 years’ experience working with children. She has the nickname “The Children Whisperer.” She has taught elementary school, directed summer camps, and ministered on all elementary levels. She is currently the full time director at St. Luke’s Episcopal Preschool on Hilton Head Island. Groups provide an opportunity to grow with friends and neighbors. When the word “church” is used in our culture we immediately associate it with Sunday services. On Sunday we go to “church” to meet with God. We also see in the book of Acts, chapter 3, the early church was involved in so much more. Beyond worship they ate together, fellowshipped, and prayed as a collective group. Their “church” was so much more than a few hours on Sunday morning. It was a community. We invite those looking for community around faith in Jesus Christ to participate in a community group. Currently, Grace Coastal Church sponsors nine community groups in the Greater Bluffton area. They are located throughout the area, meeting on different days and times. The list below gives meeting dates and times of the nine groups. Community Groups meet in a home and often share the leadership among the group. We emphasize fellowship and prayer at all of our meetings. The best way to love one another is to know one another. We welcome all middle and high schoolers to join GCY as a place to experience fun, fellowship, and service. Grace Coastal Youth (GCY) seeks to promote community and an active faith through its middle and high school program. Take a look at our church calendar and upcoming events. When participating in events, please submit a waiver for your child. The Qualls have been serving as assistants in our youth program for some time now. With a strong relationship with our current youth kids, the couple is enjoying a positive impact in the church. Brandon and Llana are currently on paternity leave as they get to know the newest member of their family. An avenue for men to study, pray and discuss specific issues as men. Men Under Grace (MUG) is a budding ministry for men here at Grace Coastal Church. The meetings provide an avenue for men to study the Scriptures, pray, and face specific issues as men. It’s also a great time to drink some coffee and share war stories together. Meetings are on Monday mornings 9:00 am at Grace Coastal Church. Retreats, events, and study times designed specifically for women to connect and grow together. Our Women’s Ministry is the ministry of and to women of Grace Coastal Church. The women grow and serve our Lord and Christ together, sharing life’s experiences and relying on God’s grace. If you are a woman, you are a part of our women’s ministry! We strive to minister to woman through social outreach. Please check our bulletin board, the Sunday church bulletins, and your email for announcements of baby and bridal showers throughout the year. Meals are also provided for families after the arrival of a new child as well as families dealing with illness and loss of loved ones. These are wonderful opportunities for us to show our love and support for our sisters in Christ who are experiencing great change in their lives. WIC provides service in various ways to Family Promise. These are relatively simple tasks, and a wonderful way for us to reach out and to serve others. We only host families four times a year for one week at a time. Learn more by visiting our Family Promise page. The Radiance Women’s Center comes along expectant mothers seeking direction and help. Support for the center is gifted through prayer, nursing, fundraising, counseling, and financial support. Learn more by visiting our Radiance Women’s Center page. Members without or who have lost their spouse are invited to a monthly lunch. This unique support group not only provides fellowship but also a time to share their lives and comfort with each other. Learn more by visiting our Odd Gloves page. Prayer shawls are lovingly made by for those in need and baby blankets are given to families welcoming little ones. Monthly prayer meetings are held among those interested. Cross stitch blessings are also given to every new baby welcomed to the church. Every year our women leave their responsibilities behind and venture out into the region to laugh till they drop, enjoy God’s Word together, and share their lives with one another. During this time, women are joined together through prayer, study and sharing stories. Many of the women continue their new friendships by going to lunch together after the study. Current Bible studies include WIC Women on Thursday mornings and SOUP Group every other Wednesday evening. Contact a team member for more information. Girls Night Out is a ministry designed to support and encourage women going through various joys and struggles in today’s world. Participants meet once a month and share refreshments, stories, laughter, advice, and most importantly, prayer needs. The group faithfully joins together both corporately during the meeting and individually in the weeks that follow bringing each other’s prayer needs before the One who is the answer to them all. Childcare is provided by volunteers from our congregation giving them their attention and love. Currently, the group gathers for “Girls’ Night Out” activities every third Thursday of the month. From time to time WIC will sponsor various fun nights. One can expect anything from a Game Night to a rousing Country Line Dancing and anything in between. Women also look forward to annual events such as our Ladies Luncheon. These times are a great time for women of all ages to gather and grow together as one. For those who have lost their significant other, Odd Gloves offers fellowship, events and volunteering opportunities. Many retirement communities are nestled in the greater Bluffton area. Within these communities and throughout Bluffton, widows have lost their spouse to the pangs of death. The Scriptures implore us to care for our widows. Led by Carol Kirker and Barbara Pape, members without or who have lost their spouse are invited to a luncheon once a month. This unique support group not only provides fellowship but also a time to share their lives and comfort with each other. We provide counseling services by appointment to help families and couples conquer trials and tribulations. Grace Coastal Church believes in relationship-based ministry. We walk by grace together as we wrestle with life’s trials and tribulations. In all we seek guidance from the Scriptures and the glory of God. Living as a fallen individual in a fallen world is not easy. While we experience the love of God through his Son, Jesus Christ, the daily application of the gospel is sometimes hard to see. There are many voices in our culture telling us many things. There is one voice of God. The body of Christ was formed in his Word to not only be a body of worship but also to be a body of support, encouragement and loving confrontation. Currently, Rev. John R. Ring handles family counseling. John has a basic certificate of counseling from the Christian Counseling Education Foundation. He is also certified in marriage counseling from the Cornerstone Institute in Maryland. He has attended the annual C.C.E.F. conference with a focus on Marriage Counseling. John has 15+ years’ experience beginning in teen counseling. His current focus is families with an emphasis on marriage counseling. He currently serves as a chaplain for both the Bluffton Police and Fire Department. John receives annual training through the chaplain association. Appointments are required. To schedule a counseling appointment contact us. “Let’s Learn Together” engages parents, volunteers, and students in providing biblical educational programs to their families and communities. Participants experience God in a safe, educational environment while learning life and outreach skills. Learn Together Lowcountry meets Friday’s 9:00 am – 4:30 pm. For more information contact Hannah Hicks at hannah@lowcountryfieldtrips.com. For more information on current schedule or to register, click here.